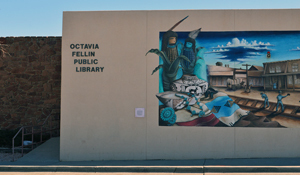 The Octavia Fellin Public Library, a 2014 recipient of the Institute of Museums and Libraries Medal for Excellence, seeks a community-oriented, energetic and innovative library professional to join its award winning team as Deputy Director. We serve a very diverse community of cultures and languages. Being the only public library in Gallup/McKinley County, the largest county in NM, we provide services to both the city and county residents, the Navajo Nation, Zuni Pueblo and Arizona residents. ESSENTIAL DUTIES AND RESPONSIBLITIES: This is high level library management and advanced professional work. Assists Library Director in overseeing and managing all library operations and services. Responsible for the library in the Director’s absence. Manages overall daily library operations. Supervises reference, collection development and the community computer training program. Coordinates community programming for adults and participation outreach activities. Identifies and writes grants. Responsible for assuring that library users receive quality services. Represents the library to community organizations developing partnerships and collaborations. Work includes identifying trends, possible new services and implementing them in a fiscally sound manner. Work requires extensive contact with library staff, library users, community organizations, other city departments, elected officials, the media and professional organizations. This position requires excellent communication skills both written and verbal. Required to work a flexible schedule which includes evenings and weekends in support of public service hours. Some travel required. Applications may be obtained at the City of Gallup Human Resources Office, 110 West Aztec, Gallup, New Mexico 87301. For more information please call (505) 863-1215. Fax:( 505) 726-2053. Job Line: (505) 863-1243. Apply online www.gallupnm.gov/jobs.aspx. The City of Gallup is an Equal Opportunity Employer that is committed to hiring qualified individuals and does not discriminate in employment or the provision of services on the basis of race, color, religion, national origin or ancestry, disability, age, gender, Vietnam Era or disability veteran status, sexual orientation or medical condition. All applicants will be evaluated solely on the basis of job-related qualifications. THE CITY OF GALLUP ENFORCES A DRUG-FREE WORKPLACE.